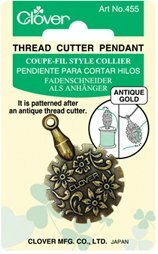 Clover thread cutter pendant Art. 455. A useful thread cutting tool for traveling, or when you don't want to lose your thread cutter! This attractive pendant can hang around your neck while you're stitching so it's always handy. It contains a circular blade within the pretty metal casing so it's safe and allowed on airlines.